This student’s question is about a problem a lot of students have. It’s about how to feel like studying. I just can’t get myself into the right zone for studying. I know I don’t study as well at certain times and I always catch myself skipping a day because of it. I get the impression that’s a major problem. Any ideas how I could get in the mood for studying more often? A common mistake for students is thinking you have to be in the right mood for studying. I know… studying is more efficient when you’re in that perfect zone but that perfect zone is a bit unpredictable. You can’t base your study routine on something as unpredictable as those feelings. As soon as you start letting off days control when you study and when you don’t, you’re going to have a whole lot of really difficult decisions to make. It’s a whole lot easier just to get into the habit of consistently studying and having that decision made for you. A funny thing happens when you start studying through the days you just don’t feel like studying. 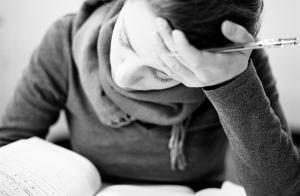 You’ll notice that those “don’t-feel-like-studying” days get farther and farther apart. The habit of studying will make it so your body feels like it prepares to study automatically before it’s time to study. On the days when you’re not really in the mood to study, you’ll often get in the mood within minutes of picking up your study material. When you get good at starting to study, you get good at getting in the zone for studying automatically. When you have a good habit you won’t need to worry about how to feel like studying. There are days when you might not study. You don’t have to be perfect but the more common these days become, the more you’re losing from your study routine. Missing one day a month is acceptable. You will have sick days or busy days that catch you off guard. That’s okay. Missing one day a week does some damage. It does more damage than missing 4 days over 4 months because it’s decreasing your ability to acclimate to the routine. Starting to study is the important part. The mood is useful but it’s more bonus than a necessary ingredient. Don’t worry about how you can get in the mood. Worry about how you can get yourself to study at all. What will it take for you to start studying consistently? When it comes to this question, virtually anything is better than nothing. If you can’t force yourself to study for a half hour every night then get yourself to study for 15 minutes. If you can’t do that, then get yourself to study for 5 minutes. The important part is that you can make whatever strategy you’re using a habit. 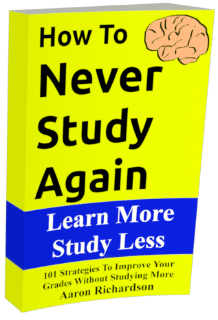 Do you want to know how to study in less than 15 minutes a night while scoring higher than 90% of the students in your class? That’s what this blog is all about. Check out the books in the sidebar to learn more. You might also be interested in reading the archives and following along with the thousands of other students learning to study less and score more. ← What Kind Of A Student Are You? I lived through this myself. I struggled with this forever until I just started doing it anyway. It’s not always enjoyable or completely productive at first but after a few weeks I was pretty much in the mood everytime I started. I know you emphasize focus. So, focus is less important than just sticking to the habit? I would think only studying when you’re focused would help dramatically.